What if You Forget to Put Eggs Into Your Baking Mixes? You can do much more with ramekins than just make dessert. 2 What if You Forget to Put Eggs Into Your Baking Mixes? Typically made of ceramics, ramekins are small bowls that are often associated with custard desserts. Yet there are a wide variety of uses for ramekins in your kitchen. They can be used to mix a small amount of ingredients, hold snacks or serve dips and salsas. 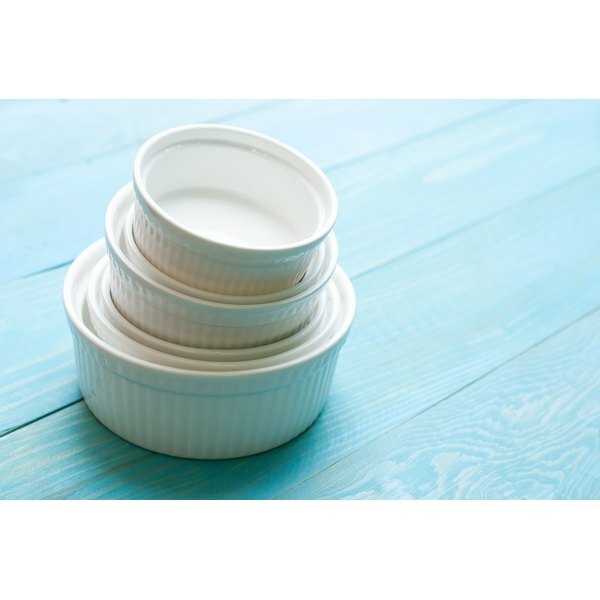 You can also use ramekins to bake many different foods -- from sweets to main dishes. This is particularly beneficial if you're watching your weight because eating from these small bowls will help you manage portion size, a key component in controlling caloric intake. Eggs have been put on the bad food list in the past, but the truth is that they are a good protein option for starting your day. The cholesterol in eggs is in the yokes, so if that's a concern you can always use just egg whites. Use ramekins to bake eggs as an alternative to the typical fried or scrambled eggs. Just crack an egg into a ramekin coated in nonstick cooking spray, pour one tablespoon of low-fat milk over it and season as desired. Try adding shredded low-fat cheese or Canadian bacon. You can also put vegetables like spinach, tomatoes or diced peppers on the bottom of the ramekin before adding the egg. Place the ramekins on a baking sheet and bake for about 15 to 20 minutes at 375 degrees F. The temperature of the egg should reach 160 degrees F, according to safety guidelines from the U.S. Department of Agriculture. Bread pudding is usually a decadent dessert, but you can fit into your healthy diet. Using your favorite bread pudding recipe and preparing it in ramekins allows you to have a small single serving, keeping calories under control. You can also experiment with swapping some of the ingredients to boost nutritional value. For example, use whole wheat bread and low-fat milk instead of white bread and heavy cream or whole milk. Recipes like the pear bread pudding featured in "The New Mayo Clinic Cookbook" uses these substitutes as well as several spices to make a healthier, flavorful dish. Portion control and attractive food presentation are both advantages you'll get when preparing main dishes in ramekins. Serving a personal a pot pie or meatloaf to your family will likely be a hit, especially for kids. You can still prepare your recipes for these classics as usual and then divide the prepared food among the ramekins before baking. You may need to cut down the amount of your original recipe, however, if you plan to use only a few ramekins. If you're concerned about grease filling up the ramekins when cooking mini meatloaves, try placing a piece of bread -- preferably somewhat stale or toasted -- in the bottom of the dish. 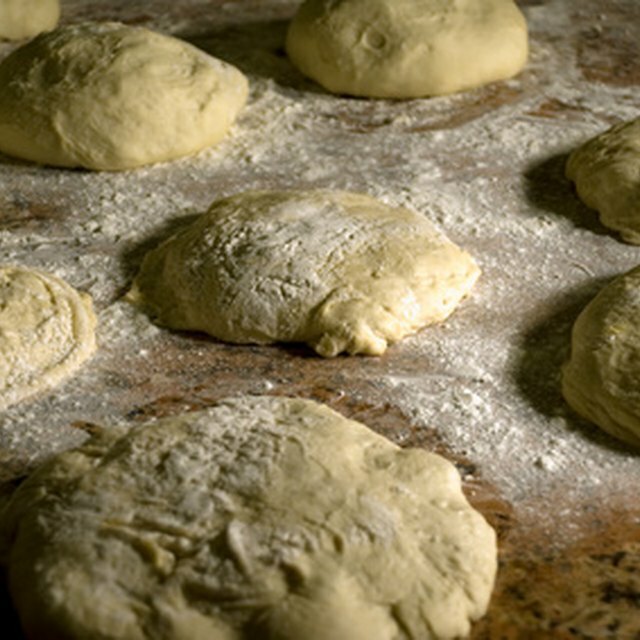 The bread will absorb a large amount of the grease. It will also help to use leaner ground beef; try to use 90 to 93 percent lean. Ramekins are ideal for many classic desserts, such as custards, mousses and even mini baked cheesecakes. They also work well for baking individual fruit desserts, such as crisps and cobblers. Crisps use a topping primarily made with dried oats while cobblers are flour based. An additional advantage to preparing desserts this way is that you can use a variety of fruits to prepare several different crisps or cobblers at once. What Is the Difference Between a Bagel & a Donut?